Momentum : Shepherding The Small Church 2nd Ed. 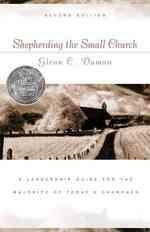 SHEPHERDING THE SMALL CHURCH 2ND ED. Despite the growing number of megachurches in the U.S., 75 percent of churches still have a weekly attendance of 150 or less. Glenn Daman, himself the pastor of two small churches, reminds readers that "the vitality of a congregation is not found in its size or its programs or budget. The vitality of a congregation is found in its fulfillment of God's purpose for the church." Offering neither trivial cliches nor quick fixes, "Shepherding the Small Churc"h acts as a manual for leaders, offering point-by point suggestions for small church ministry, mission, unity, and more. Chapter-by-chapter suggestions and several appendixes of helpful assessment tools help pastors and lay leadership work through the book together.